There is something truly inviting about trampolines. Few people in this world can resist them. Maybe it’s because they give us superhuman jumping ability. Maybe it’s because they let us look down on our normal existence. Or maybe trampolines are just pure fun. Whatever it is that draws people to trampolines, it’s impossible to deny. For kids, in particular, trampolines are a huge draw. Jumping on a trampoline for the first time is almost a rite of passage to some. Trampolines promote enthusiasm, physical activity, and most importantly, fun. Skywalker Trampolines is a company that makes high quality trampolines and trampoline accessories, ranging from ground stakes, to ladders, to enclosures. They make these products with a keen eye to detail, and put their full effort into every inch. The company’s premier trampoline is the Skywalker Trampolines Round Trampoline; a trampoline that provides equal parts durability and functionality. 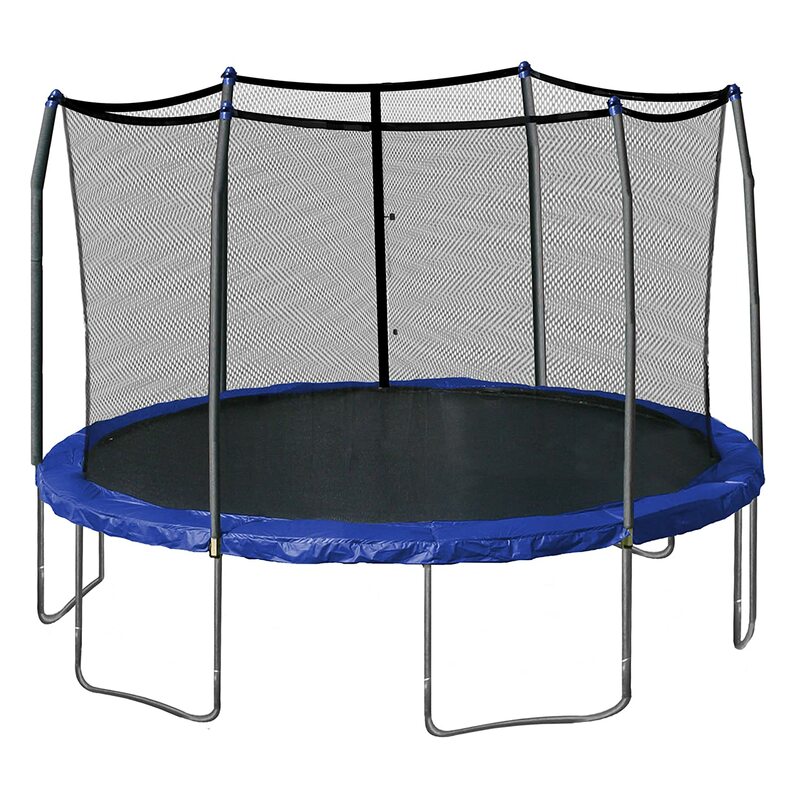 From its durable springs to its reliable construction, this trampoline is as reliable as they come. Whether you’re a 300 pound man or a 80 pound child, this trampoline is a product that provides you with both effortless exercise and endless fun. Let’s start by talking about the trampoline’s structure. The legs of the trampoline consist of reinforced welded t-sockets which give the trampoline maximum stability and keeps it from twisting due to force. The legs are made of galvanized steel, providing a strong and sure structure that can hold a great deal of weight over long periods of time. The steel is rust resistant, meaning you can leave the trampoline outside all year long without it being destroyed by the elements, such as snow and rain. As far as trampoline structures go, this structure is as safe and secure as it gets. The padding of the trampoline is very cushy, providing an excellent landing space for misplace falls and leaps. The risk of injury will be greatly reduced by this cushioning. It attaches to the frame snugly and doesn’t budge without a fight. You can purchase the padding in four different colors, giving you an opportunity to match your trampoline with the other items in your yard. These colors include green, red, camo, and blue. An important aspect of this trampoline is its safety enclosure. Unlike many enclosures that connect to the trampoline at its frame, this enclosure attaches to the trampoline’s jumping surface. This is important because the springs will be on the outside of the enclosure, which will greatly reduce the chance of someone falling on them and twisting an ankle. It also ensures that the enclosure moves with the weight of the jumping surface, letting it flow with the natural movement of the person jumping. Made of rust-free galvanized steel, the frame of the enclosure is very strong, and resistant to rain and snow. The netting of the enclosure is made from polyethylene which is UV-protected, giving it relief from the harmful rays of the sun. This will help the net to last longer, giving the trampoline more durability. The springs of the trampoline are 6.5 inches long, and are heavy gauged, making them strong and durable. This will reduce the chance of the trampoline malfunctioning, and in turn, help to reduce the risk of injury. There are 96 springs in total, meaning that even if one breaks, there are still a bevy of strong springs that will do a great job of maintaining the trampoline’s integrity. Like the rest of the metal on the trampoline, the springs are rust-resistant, making them safe from rain and snow. The trampoline’s jumping surface is made from heavy duty polypropylene, giving it excellent bounce while also making it as strong and durable as possible. You won’t have to worry about falling through the trampoline and becoming seriously injured. In addition, the surface is resistant to the sun’s rays, giving it a longer lifespan and more quality overall. Online reviewers love this trampoline for how easy it is to set up. One reviewer reported that it took her and her family about an hour to install it completely. Reviewers also laud the trampoline for its durability, stating that they leave it outside in the snow over the winter with absolutely no problems. In general, reviewers enjoy the trampoline because it gives them and their families a fun activity to participate in with together. One of the complaints made by online reviewers is that the padding of the trampoline began to fade and tear apart at the seams within a few months of being outside. Another fairly common complaint is that the enclosure netting began to fall apart within a year. Unfortunately, the warranty for the enclosure only lasts a few months. As far as trampolines go, the Skywalker Trampolines Round Trampoline is as good as they come. It combines maximum durability and strength, with premium performance to create a trampoline that is equal parts safe and enjoyable. At 125 pounds, with a 15 foot diameter, this trampoline provides a large space for one or several people to jump on. It’s light enough to move easily, but not so light that the wind will blow it away. If you’re interested in purchasing what is simply the best trampoline on the market, you should definitely consider the Skywalker Trampolines Round Trampoline. Zupapa is a company based in Germany that has gained some traction with trampoline buyers recently. Their Zupapa TUV Approved Trampoline is lauded for its safety as it has been approved by the German company TUV. TUV translates to Technical Inspection Association, and is a company that validates the safety of German-made products. But, though Zupapa likes to make light of this fact, they often overshadow just how great the other aspects of their trampoline are. It is not only safe. It is also highly functional, providing fun and exercise for both children and adults. The structure of the trampoline is very much like most high quality trampolines. Its legs consist of heavy duty, galvanized steel that is both strong and resistant to rust. This, combined with superior welding and strong t-joints makes the legs as durable and strong as possible. You can leave the trampoline outside all through the year as it will protect itself from both rain and snow. The legs measure in at 42 millimeters in diameter, making them part of a very thick and tough structure that can hold a great deal of weight. While most trampolines max out at around a 300 pound weight limit, this trampoline has a staggering 375 pound weight limit. Jumpers both big and small will be able to enjoy the trampoline’s benefits. The padding of the trampoline is cushy and taught, clinging tightly to the frame and over the springs. It absorbs misplaced landings as good as any trampoline padding you can find. Blue in color, it serves not only to protect from twisted ankles, but to also provide the trampoline an aesthetically pleasing touch. The trampoline’s enclosure is its most important aspect, as it keeps enthusiastic jumpers from accidentally falling over the edges of the trampoline. Its frame is made of galvanized steel that is very strong and resistant to the elements, making it tough and durable, and providing a great deal of resistance to any weight it might have to take on. Like the legs of the trampoline, the enclosure’s poles measure in at 42 millimeters in diameter. The enclosure’s net is strong and durable as well, providing maximum safety and protection to anyone who uses the trampoline. The springs on the trampoline are 7 inches long, and are made of heavy gauged metal. This makes them not only tough and durable, but also very bouncy and reactive to weight. They will have no problem propelling people of all sizes to a high, yet safe distance that is as fun and as safe as possible. The jumping surface on the trampoline is made of heavy duty polypropylene that absorbs weight with great flexibility, providing a safe but high performing space for anyone to land on. It is made in a manner in which it is resistant to the harmful rays of the sun, withstanding great amounts of exposure without becoming bitter and frail. Accessories included with the trampoline include a steel ladder that ensure easy access to the trampoline as well as a rain cover that protects the trampoline from the elements during down time. Online reviewers love this trampoline for how much weight it can hold, with several reviewers stating that the entire family can get on the trampoline together with no problems. They also laud the trampoline for its durability, remarking on how well it has held up despite heavy use over long periods of time. In addition, reviewers found it easy to set up and also very light in weight. Some reviewers noted that the padding of the trampoline tends to rip at the seams, necessitating the purchase of a new padding quite often. A few reviewers also reported that the zipper on the enclosure broke quite early in its existence. However, many reviewers also noted that the company had great customer service and dealt with their problems in a timely and professional manner. Available in sizes of 12 feet, 14 feet, and 15 feet in diameter, the Zupapa Tuv Approved Trampoline offers great strength, fun, and variety for people of all ages and sizes. While it’s one of the safest trampolines on the market, it is also one strong trampolines on the market, providing consistent and reliable performance for as many people as possible for years to come. If you’re looking for a trampoline that won’t give up on you as it gets older, the Zupapa Tuv Approved Trampoline is the trampoline for you. The Ultega Jumper Trampoline with Safety Net is a slightly cheaper option, but with standards similar to that of more expensive trampolines. It provides safety and performance in a way that leads to both fun and relaxation for anyone wanting to jump on it. Its structure is very safe, durable, and consistent. 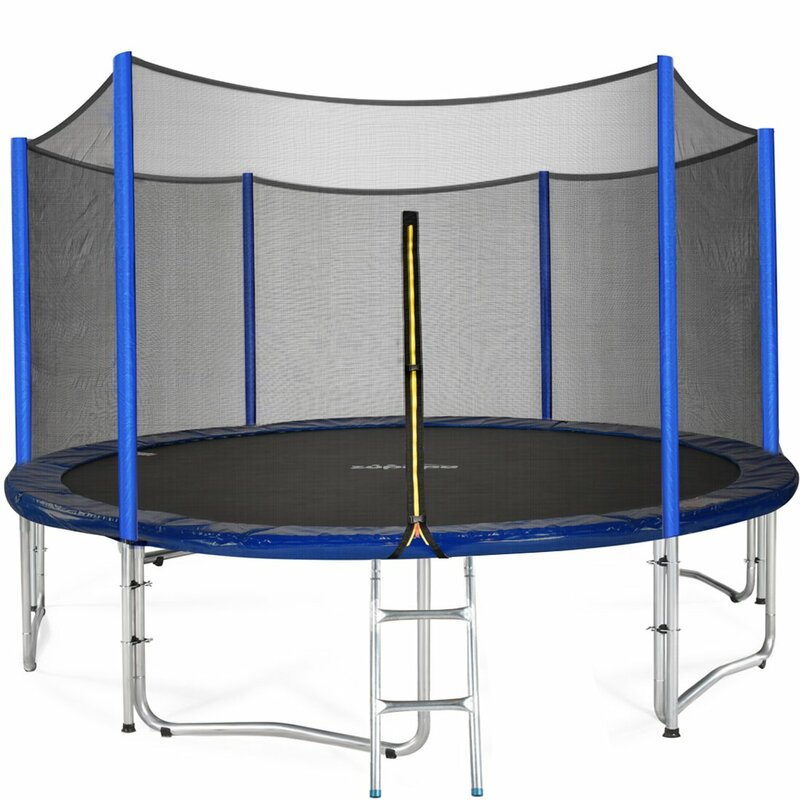 Galvanized steel legs form t-joints that flatten out at the bottom, providing a very secure base, and keeping the trampoline steady at all times. Because the steel is galvanized, the trampoline is protected from the elements, withstanding snow and rain all throughout the year. The padding over the springs provides a firm but cushy landing spot for errant falls, helping to reduce the risk of foot injury and keeping the jumper safe in general. In addition to the safety the padding provides, its bright blue color will add a nice aesthetic to your backyard. Keeping the trampoline safe is the net enclosure. It consists of 8 padded steel poles that are both resistant to weight and protected against the elements. They will have no problem absorbing month after month of rainfall. The net of the enclosure is strong and will keep jumpers from slipping over the edge. 64 springs attach from the frame to the jumping surface, providing a great deal of resistance and backup if one of the springs were to break. You won’t have to worry about the integrity of the trampoline’s frame being compromised simply because one spring breaks. It will maintain its overall quality, and continue to provide the bounce that is typical of its springs. The trampoline’s jumping surface is strong and durable, providing a consistent and reliable landing spot for anyone up to 200 pounds in weight. Overall, the trampoline is designed for children, though adults under 200 pounds can also have a great time utilizing its benefits. Online reviewers love this trampoline for how safe it is, stating that they feel very comfortable with their kids being on it. They have also noted that it performs well, and that it can hold a great amount of weight, with several people jumping on it at once with no problems. A complaint made by several online reviewers was that the trampoline’s padding tore at the seams and needed replacement within a year of being owned. Another common complaint made by online reviewers about the trampoline is that it was not easy to set up. Some reviewers had trouble with the directions, while others did not receive all of the parts required for an adequate setup. However, almost all of these reviewers reported having a great experience with customer service. Coming in 5 different sizes, including 6 feet, 8.5 feet, 10 feet, 12 feet, and 14 feet, the Ultega Jumper Trampoline with Safety Net provides its fun with a great deal of variety. In addition, you can rest assured that your child will always be safe when jumping on the trampoline. It’s undoubtedly fun, but as with any good trampoline, it puts safety ahead of all other aspects. If you’re looking for a reliable and safe trampoline for your children to enjoy, the Ultega Jumper Trampoline with Safety Net is a trampoline you should take a look at. Perhaps you’re dying to get your hands on a trampoline, but don’t want to shell out the large amount of money that it typically costs to purchase one. There are a number of affordable trampolines that provide safety and performance that is comparable to trampolines of much higher prices. One of these trampolines is the AirZone Spring Trampoline with Enclosure. The trampoline’s structure, like other trampolines on the list, is strong and durable. With legs made of galvanized steel, the trampoline is safe from rain and snow all throughout the year. The legs are W-shaped, providing two pressure points on each leg for weight to come down on softly. Overall, the structure provides maximum safety and durability, giving the trampoline a long and prosperous lifespan. A blue padding over the springs is both cushy and firm, providing a safe and secure landing spot for misplaced jumps. The springs fall outside of the enclosure, meaning that the chances of your foot striking the padding are poor to begin with. The padding is sewn into the trampoline, giving it added strength and durability, and preventing it from falling apart before its time. Rubber padded, steel reinforced poles frame the enclosure of the trampoline, making it strong, safe, and resistant to poor weather conditions. The netting of the enclosure is strong and taught, assisted by a bungee cord at the top of the enclosure that keeps everything tight and in place. This all comes together to provide the jumper with an enclosure that maintains maximum safety and strength. The springs of the trampoline are made of stainless steel that is both durable and bouncy. In addition, these springs are resistant to the elements, proving safe from rust and early deterioration. They come together to give the trampoline both bounce and safety. The jumping surface of the trampoline is safe and durable, providing maximum bounce without flexing too low, and without launching too high. You certainly won’t have any trouble with falling through it. It is designed to hold 175 pounds, so children and lightweight adults are its most appropriate users. Online reviewers reported that this trampoline is very easy to set up, stating that they set it up in under an hour. Several reviewers loved that the trampoline was closer to the ground than many trampolines because it reduced the risk of serious injury to their children. Reviewers also laud it for its great performance at an affordable price. Some online reviewers complained that the trampoline’s enclosure and padding fell apart very easily. A bevy of reviewers said that trampoline was missing parts when it arrived to them through shipping. Some were very upset about this, and found it difficult to get additional parts. Some reviewers found that the trampoline was too small, and didn’t believe that it could hold their weight. 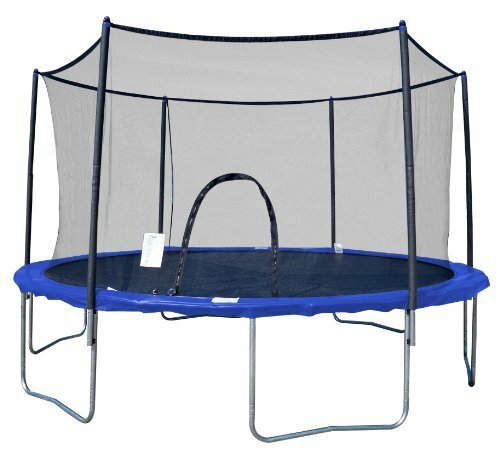 The AirZone Spring Trampoline with Enclosure is a trampoline designed to hold lighter weights, and seems to be particularly designed for children. It measures in at 10 feet across, making it smaller than many trampolines, yet still plenty big to get as much jumping in as is humanly possible. Most importantly, the trampoline does not sacrifice anything in the way of safety. You can rest assured that your children will be free of harm while they’re jumping on this trampoline. The only thing you should expect is that you and your children are going to have a great time. So, If you’re looking for a fun and safe trampoline on a budget, you might consider the AirZone Spring Trampoline with Enclosure. 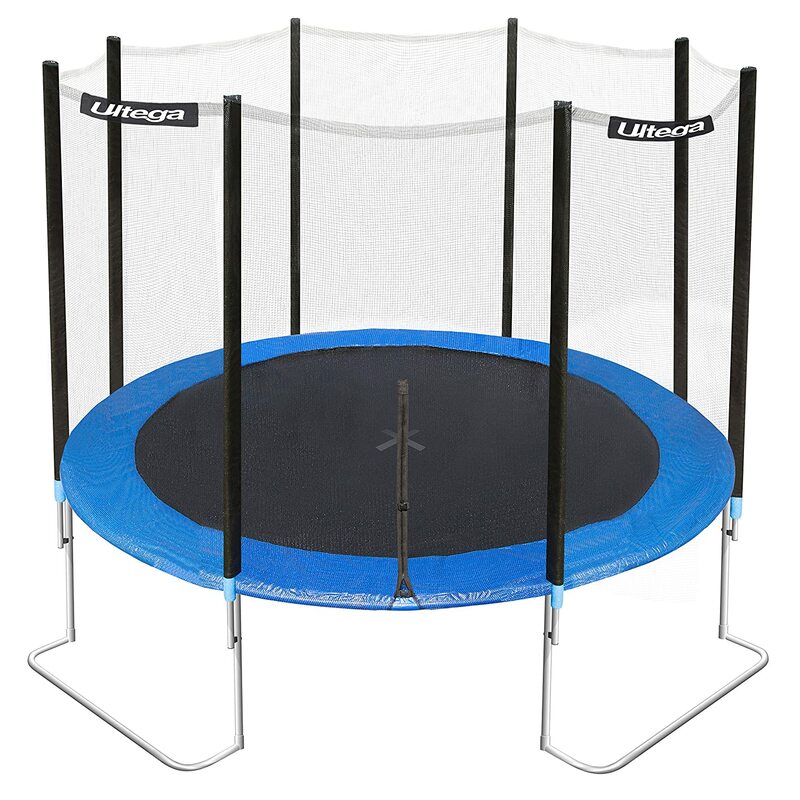 For around $160.00 on most online retail sites, its a great deal for a quality trampoline. When it comes to trampolines, safety is the most important consideration. If a trampoline is not used properly, it can result in serious injury, and possibly even death. One of the dangerous spots of a trampoline is the space in between the frame and the jumping surface where the springs stretch across, leaving large, open holes. If a person’s foot were to land in one of these holes, that person could very easily break his or her leg, or tear a muscle, or both. That’s why it’s important to cover the holes with a strong, padded surface that can take force and prevent the jumper from injuring him or herself. The padding should have some give so that the foot doesn’t feel like it’s striking pure metal. It should also be very tight to the springs so that the jumper’s foot can’t slip underneath it. Perhaps the most important aspect of a trampoline is its structure. A quality structure will hold great amounts of weight while also remaining durable over a long period of time. The main component of the trampoline’s structure is its frame which latches the springs and holds up the jumping surface. Frames come in many different shapes and sizes. Typically, the thicker the bars of the frame, the more weight the frame can hold. Frames are most often put together with the use of welding, though the quality of each weld can differ drastically. When looking at the weld, you should search for a smooth and consistent weld. This is a quality weld that will keep consistent structure and hold up well over time. If a weld looks rough and uneven, it is not a good weld, and is susceptible to early damage which can lead to injury. Not to mention, the rough nature of the weld could make the frame sharp, increasing the risk of the user cutting him or herself. As far as the formation of the frame goes, there are several different types, with the safest type being the T-bar joint. T-bar joints require little to no welding, meaning they are less susceptible to early deterioration and destruction. This will ensure greater safety overall. So, to recap, when looking at the trampoline’s structure, consider whether or not it has T-bar joints. If it does, it has a great structure. If it doesn’t, it should at least have quality weld work done to ensure maximum safety. Not all trampolines come with enclosures, but they probably all should. Considering the fact that a trampoline can catapult someone about 15 feet in the air, it would be wise to have an enclosure that would stop that person from falling off the edge and hitting the ground with a great deal of force. This could lead to very serious injury, or maybe even death. You don’t want to have to worry about the safety of your children when they’re just trying to have some innocent fun. An enclosure will also stop the bouncer from landing awkwardly on the edges of the trampoline, reducing the risk of sprained ankles and broken bones. Each trampoline gets its bounce from one of two things: elastic bands, or metal springs. While both options initially provide excellent results, elastic bands tend to wear out rather quickly, leaving the trampoline with no bounce further down the line. Springs, in general, tend to last much longer. However, not all springs are created equally. On a poorly-constructed trampoline, springs will often break very early in the trampoline’s existence. In addition to this, certain types of springs will rust more quickly than other ones. In both of these cases, a dangerous situation is being created. Broken and brittle springs lead to a collapsing trampoline which leads to serious injury. Good springs are zinc-coated which prevents them from rusting. When buying a trampoline, you should make sure to find one with zinc-coated springs as they will last longer and do a better job of preventing serious injury. Considering the fun and exercise it can provide, a trampoline could be one of the best purchases you ever make. Your children will undoubtedly love it, and you can even get some excellent use out of it yourself. Of course, you can’t have fun if you’re getting injured, so it’s important that you pick the safest trampoline you can find. If the trampoline you’re looking at has a strong structure, zinc-coated springs, secure but forgiving padding, and a high quality enclosure to surround it, it is a safe, durable, and effective trampoline that will provide you with consistent and reliable fun for years to come.